"I had these clever breakfast treats at a brunch gathering. They are easy to make for just two people or for a crowd. You can double or triple this recipe for a crowd. I use a muffin tin to hold each avocado half if I am making several of them." Place each avocado half in a ramekin. Crack 1 egg into each avocado half; season with salt, black pepper, and cayenne pepper. Place ramekins on a baking sheet. Bake in the preheated oven until entire egg is cooked through, about 15 minutes. Sprinkle each avocado with bacon and chives. 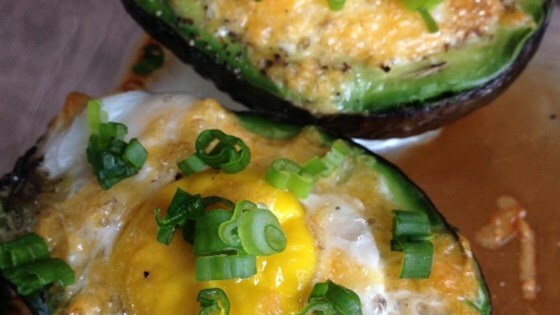 Avocados offer a perfect vessel for baked eggs in this easy breakfast recipe. You may have to carve out a little bit of the avocado meat so the egg can completely fit. Very easy and healthy to eat. This is also a kid friendly breakfast. You can also use this for a brunch side. However I did mine a full 20 mins. At 450F. It's perfect every time!